Wondering how to look elegant just like your favorite royalty? 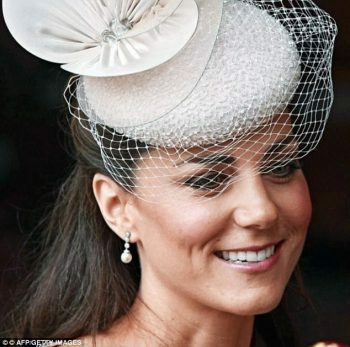 Today’s post will show you eight simple ways to look as stylish as Kate Middleton, the Duchess of Elegance. She is well known for her grace, style, elegant fashion sense, and her rules of etiquette. We totally admire her and we love how she uses classic fashion tips in her own advantage. So keep reading to find out how to look stylish without too much effort. Every single way will be easy to follow and you’ll be able to incorporate it in your everyday life starting with the next occasion. In order to show you these simple ways to look amazing in any context, we studied a bit some of Kate’s appearances and found out how to look elegant and classy taking into account these eight rules. 1. Pearls are the girl’s best friends – wear them on all occasions! First of all, there is no doubt that Duchess Kate is a real pearl lover. She is a truly sophisticated lady and her taste for jewelry can clearly be seen in her public appearances. One might say that wearing pearls, especially pearl earrings. is her secret style weapon. So if you want to look fabulous, make sure to wear some real pearls. She is also teaching us how to wear pearls correctly. The number one tip is to wear pearl according to your face shape. If you have a long face, then go for round shaped pearls. And if you have a round face, go for elongated pearls in order to make your face appear slimmer. In these photos you can see that pearls are a go-to source for Kate and she loves pearl drop earrings more than any other accessory. If you are looking for a similar pair, here is our suggestion. An important lesson of elegance and style is that you should always hold your handbag/clutch in your hands and never under your arm. Here is how you should always hold your small bag during formal occasions: as Kate does, always pick a small fine clutch and hold it with both hands. You can hold it with one hand also, but never get it tucked under an arm and pay attention not to place it on the ground or table. Without any doubt, lace screams elegance. Once again, Kate shows us how to look elegant and classy with a whole lace dress. Embroidered white lace is not only for weddings, so dare to wear it on other occasions too! Slightly above the knee, the lace dress will make you look refined and feminine during daytime events. And for evening parties, you’ll definitely make a statement with a long sleeved lace dress. For those of you who have extra time to dedicate for your appearance, pick a good tailor and get your favorite pieces fitted. This way, you’ll look posh and remarkably elegant. Simple clean cut lines will flatter any figure and will accentuate your curves. With all the altered sizes on the market, custom fitted clothes really make the difference! If you don’t have time to get your clothes fitted, invest in some structured belted coats, which will really make you look statuesque and slimmer too! With the right belt, you will accentuate your silhouette and you’ll even create an entire outfit with just one coat. Kate is showing us how to look attractive and sophisticated in over the knee coats – her favorites! When wearing a dress slit, it’s very easy to fall into the vulgarity trap. If you want to look elegant and stylish, you should not pick a wide slit. Kate is always wearing a one side slit dress, never two sides. If it’s an evening event, the length of the slit can be over the knee, but daily events require a decent slit dress. When sitting, it is imperative to keep good poise and posture in order to look elegant and mannered in the same time. You should keep your feet together to one side – known as ‘The Duchess Slant’ – with heels firmly on the ground. A useful tip is to slant your legs according to the seat: the lower the seat, the more your legs will slant. If you want to cross your ankles, make sure to keep your knees and ankles together, because this way will stop you from accidentally revealing too much. Plus, it will make your legs look longer! Romantic braided updos or low hair updos are Kate’s go to hairstyle when it comes to looking extra glamorous. She likes to keep her hair off her face in tidy buns or medium tight braids. As you may have guessed, our favorite looks is the one with pearl details. You can also try this look by keeping your swirly hairstyle in place with elegant pearl-accented bobby pins. You’ll look very chic! All in all, we hope we showed you some useful tips on how to look elegant and classy. Lady Kate is a true source of inspiration and we love her remarkable elegance. Style-wise, her signature style is very easy to imitate and learn from. It’s true that she has an army of people helping her to look amazing every time, but her unique and delicate appearance is entirely her merit. She knows how to look fashionable in a classy, yet very affordable way. So if you think these 8 lessons of style are precious enough to be integrated in your everyday life, don’t hesitate to do it! We can guarantee you’ll make a great impression all the time.